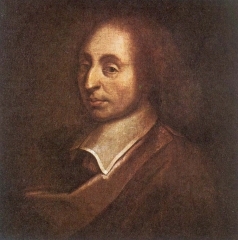 Born in France in 1623, Blaise Pascal was the third child and only son of Étienne Pascal. His father did not believe in the French school system so he opted to homeschool his son. Ironically, the one subject that Pascal did not learn was mathematics. His father did not want his son to learn the subject until he was 15. Starting late did not have much of a negative effect on Pascal’s skills as a mathematician since he would go on to great fame as a legendary math trailblazer. In fact, Pascal would study math on his own in secret. In particular, he would study geometry. At the age of 12, he made the discovery that two right angles are the sum of a triangle. Pascal continued to take his study of math very seriously. As a young man, the culmination of his work would lead to his innovative developments in projective geometry theorems. Pascal followed his father to Paris when the elder Pascal was offered a job as a tax collector. In February of 1640, in Paris, Pascal published one of his most important works – Essay on Conic Sections. To help his father out with the collection of taxes, Pascal also designed and invented a primitive calculator. Attempts at marketing the calculator were attempted, but they did not sell. In 1646, Pascal was placed under the care of two brothers from a local religious order when his father suffered a major injury. During this time, Pascal would have a religious awakening that would have a profound impact on the rest of his life. During the time of his religious experience, Pascal invested a tremendous amount of effort studying about atmospheric pressure. He undertook a series of unique experiments and which revealed a great deal of information that had not been known prior to Pascal performing his experiments. In 1653, Pascal published the groundbreaking work The Treatise on the Equilibrium of Liquids. The Generation of Conic Sections was another project he was working on publishing, but it was never finished during his lifetime. Pascal’s most famous work from the time period would be The Treatise on the Arithmetical Triangle, which was an innovative study into the triangle that would set the stage for a great deal of geometric revelations in the future. Pascal began getting ill at a relatively young age. He ended up bedridden for a time, but was still able to continue his work in math and physics. Pascal became involved in a near fatal horse carriage accident that almost killed him. At age 39, he suffered from stomach cancer that eventually spread to his brain and resulted in his death.